The present study aims to evaluate in rats the activity changes associated to treatments with D2-like receptor agonists using a simple behavioral procedure. Rats receiving a single dose of 1 mg/kg quinpirole or vehicle were scored for 6 spontaneous behaviors at different post-injection times. In each time point, the animals were placed in testing cages for 12 min and video-recorded during the last 2 min. The number of forelimb steps and the time spent sniffing were significantly increased by 15 min post-injection in the quinpirole group. Forelimb steps remained increased for at least 24 h. Scores of time spent sniffing, as well as time inactive and number of hindlimb steps appeared greatly altered at 90 and 180 min, but not at later time points. By 48 h, no differences between control and quinpirole-treated rats were observed. In conclusion, the simple behavioral procedure here proposed—or adaptations of it—provides a sensitive test to evaluate the time course of the effects of D2-like receptor agonists on rat spontaneous activity. Additionally, this test takes into account context-dependent sensitization. It can be adapted to different treatment conditions. This methodology would be useful for the preclinical screening of D2-like receptor drugs, using reduced numbers of animals to test those doses and treatment schedules producing less side-effects. Dopaminergic drugs produce complex patterns of behavioral effects as a result of the diversity of nervous structures receiving dopamine input, the duality of dopamine receptors with opposed action and the existence of both presynaptic (which regulate dopamine synthesis and release  ) and postsynaptic receptors with different affinity  . Furthermore, phenomena such as desensitization  or sensitization   of dopamine receptors add additional uncertainty on the outcome of a given treatment. Even in controlled experimental conditions, a given dose of a dopaminergic drug may elicit biphasic patterns of behavioral activity   , different doses may produce opposite responses, and the effect of chronic treatments may differ from the effect of acute drug administration   . The D2-like family of dopamine receptors (D2R) has been involved in several psychiatric conditions, like schizophrenia, bipolar disorder, compulsive-obsessive disorder, ADHD or addictions. When tested in rodents, selective D2R agonists like quinpirole, pramipexole or ropinirole have been shown to produce changes in basal activity and locomotion, stereotypies, context-dependent sensitization or compulsive checking behavior. Those behavioral outcomes can be considered as experimental indicators of the unwanted side-effects observed when D2R agonists are used to treat diverse neurological conditions, like Parkinson’s disease or restless legs syndrome. Preclinical screening of new selective or partial agonists for neurological or psychiatric treatment would be expedited by the availability of simpler and faster animal behavioral tests. Here I present an easy, inexpensive and reproducible procedure to quantify the intensity and time course of the pharmacological effects of D2R agonists on rat spontaneous behavior. Adult male Sprague-Dawley rats weighing 250 g were used. The experimental procedures were approved by the Ramon y Cajal Hospital Animal Welfare Ethic Committee and followed the ethical guidelines of the Spanish legislation on “Protection of animals used for experimentation and other scientific goals” (RD 1201/2005). The rats were bred in the Ramón y Cajal Hospital animal premises, where fresh male breeders from Charles River (France) were introduced to the colony every 4 - 5 months. Relatively low numbers of experimental animals (10 rats per experimental group) were purposely used to demonstrate the sensitivity of the procedure. The animals were housed 2 per cage and maintained at 24˚C room temperature under a 12-h light/12-h dark schedule. Hindlimb stepping: Number of times that the animal raises the right foot from the floor, whether for body displacement or not, except when done for grooming. The animals were identified by a number printed at the tail base. Of each cage, one rat was randomly assigned to vehicle group and the other to quinpirole treatment group. All the procedures were carried out under quiet conditions in a testing room adjacent to the rat stock room. The behavioral tests were started at the 3rd hour of the light period. After each behavioral recording, the animals were immediately returned to their home cages in the maintenance racks with food and water ad lib. Rats were habituated daily to the experimental procedure for 3 days previous to the tests by placing them undisturbed in the testing boxes for 15 minutes. The treatment consisted in a single intraperitoneal injection of 1 ml of NaCl isotonic solution per kg of body weight containing 1 mg/ml (−)-quinpirole hydrochloride (Sigma-Aldrich ref. Q102) or nothing else in vehicleinjected group. Injections and behavioral recordings were performed under a fixed time schedule and both animals in a cage received the treatment at the same time and were recorded simultaneously starting at precise times. Ten minutes before each recording, the rats were placed undisturbed in their respective testing boxes to habituate. Testing boxes consisted in transparent square cages (17 × 22 × 14 cm) with a grid bottom made of 7 mm wire mesh (to prevent accumulation of urine or feces). Animals were video recorded with a high definition web camera (Logitech HD Webcam C270) at 30 frames/ second downloading to a computer. The camera was placed at a distance of 56 cm from the front of the testing cage and was elevated 30 cm above the level of the cage floor to have a complete vision of the whole cubicle. A slightly angled mirror was placed opposed to the camera so that recordings contained no hidden spots and all parts of the animal were visible. No additional illumination was required besides ambient light since the video recording provided sufficient picture quality and both direct and mirror images were on focus. The recording lasted 120 seconds, after which the animals were immediately returned to their home cages. Video analysis was carried out after all animals had been recorded. The analysis was performed by scoring one behavior and one animal at a time by repeated playing of video recordings. A hand-held digital chronometer was used for time scoring and a tally counter was used for scoring events. Statistical analyses were performed with the help of GraphPad Prism software (v. 4.03) and consisted in twoway ANOVA of repeated measures with Bonferroni’s post-test. Differences were considered significant when p < 0.05. No value was considered outlier. Six different behaviors were scored in rats during 120 s periods at different time points after intraperitoneal injection of 1 mg/kg quinpirole or vehicle (Figure 1). Each behavior followed a characteristic time course of outcome response in the present experimental conditions. As a general trend, in control (vehicle-injected) animals, highest level of activity was observed at the 15 min time point, decreasing afterwards except for a mild rise of activity at the 24 h time point. Quinpirole administration changed that time course in some behaviors. Forelimb stepping scoring was the most sensitive outcome measurement to show the pharmacological activity of quinpirole. After injection of the D2R agonist, forelimb steps increased significantly at 15 min (p < 0.01) and this effect was still observed after 24 h (p < 0.05). Time spent sniffing was also a reliable indicator of the behavioral changes produced by quinpirole, increasing significantly already by 15 min (p < 0.05); at 90 and 180 min time points quinpirole-injected rats performed continuous sniffing. However, by 360 min this behavioral score was not sensitive to show differences with the present number of experimental animals. Hindlimb stepping was also markedly increased and time spent inactive was practically null in quinpirole-injected rats at 90 and 180 min, but these behavioral scores were not statistically different earlier or after 360 min. 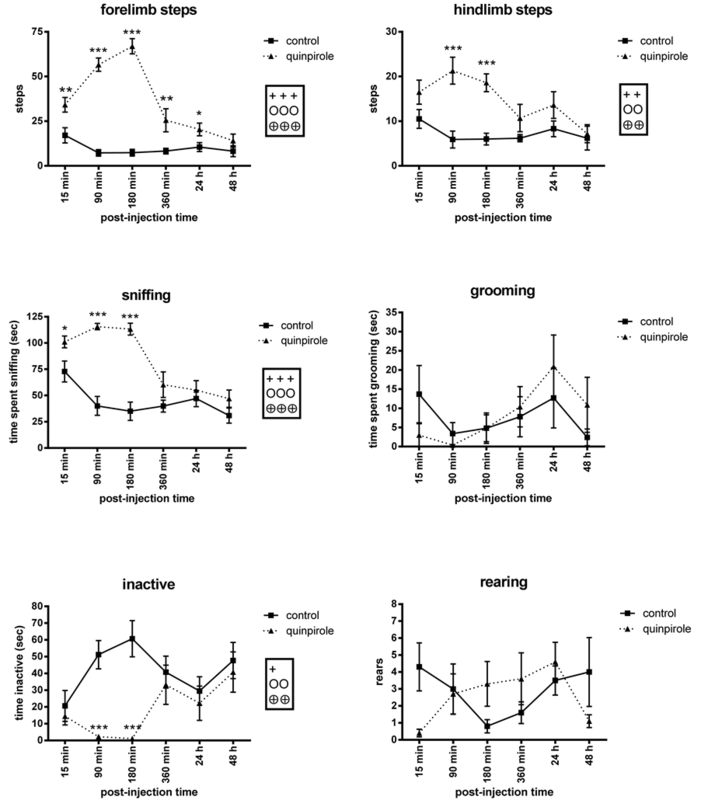 Rearing and grooming scores yielded less consistent measurements of rat activity and were not sensitive enough to show the behavioral effect of quinpirole in the present experimental conditions (not significant ANOVA test for time, treatment or interaction). Based on previous observations, we devised a test that could provide easy, fast, reproducible and inexpensive measurements of the effects of quinpirole on spontaneous activity of rats. Using purposely reduced numbers of experimental animals (10 rats per experimental group) neurological actions of D2R agonist can be behaviorally revealed by this methodology. The behavioral manifestations of quinpirole are context-dependent   so rats in their home cage, accompanied by other familiar rats, may not show overt signs of sensitization, stereotypy or compulsive checking after quinpirole administration. The action of placing the animals unaccompanied in the testing cage, even when such stimulus is not novel, triggers the display of a panel of characteristic behaviors that can be measured. The 10-minute period in the testing cage previous to the 2-minute recording is essential for development of such behavioral manifestations, so the timing needs to be rigorously kept for reproducibility of results. The methodology, or adaptations of it, could be similarly used for testing the time course of the effects of dopaminergic drugs with precision of less than one hour and can be used likewise for testing differences of spontaneous activity in chronic treatments or interactions with other drugs, like clomipramine  , provided that the testing schedules are strictly fixed. Figure 1. Scores of 6 spontaneous behaviors in 120 sec recordings. Rats were placed undisturbed for 10 min in the testing cages and video-recorded for the following 2 min. Values represent mean ± SEM (n = 10). Dotted-line follows the time course of scores in 1 mg/kg quinpirole-injected rats and continuous line, that of vehicle-injected (control) rats. Symbols: significances of two-way ANOVA for time (+), column (O) or interaction (Å) and t test (*). Statistical significance: one symbol: p < 0.05; two symbols: p < 0.01; three symbols: p < 0.001. Most previous studies have measured locomotor activity to test the dose-response and time-course of the pharmacological action of quinpirole   , while a few have used open field checking activity  , operant conditioning  or spontaneous activities like sniffing, rearing, grooming  or yawning  . These tests, however, lack time precision since they measure behavior along extended periods and thus stimulus novelty, which is relevant for context-dependent manifestations, is gradually lost. The present report is meant to propose a new simple method to assess the behavioral activity of D2R agonists. It remains to be validated by using other D2- or D3-preferring agonists as well as by low doses of agonists which would preferentially act on presynaptic autoreceptors  . On the other hand, this method has been developed using Sprague-Dawley rats, which is the strain that has been used more often for studying the psychopharmacology of D2R agonists. It remains to be tested if these behavioral responses to quinpirole treatment are kept in other rat strains, like Wistar or Long-Evans. Of the six signs of basal activity that have been scored in the present study, the behavior here defined as “forelimb stepping” appears to be the most sensitive detector of the effects of quinpirole, being able to reveal these effects as early as 15 min and as late as 24 h after a single 1 mg/kg dose. We have not found reports in the literature showing behavioral effects of acute quinpirole after 24 h, so it appears that recording of forelimb stepping provides a highly sensitive test on the action of D2R agonists on basal activity. At 90 and 180 min time points after the quinpirole injection, rats displayed continuous sniffing accompanied by frequent limb movement. By 6 h quinpirole-treated rats showed some inactive periods and by 24 h only forelimb movements remained significantly raised. No difference in spontaneous behavior was detected by 48 h. This notwithstanding, the neurological activity of quinpirole persists at that time, since we have observed that a single injection of 1 mg/kg quinpirole inhibits tactile allodynia for longer than 48 h in rats subjected to chronic constriction injury of the sciatic nerve  , which would suggest that analgesia by quinpirole can be achieved without accompanying alterations in basal activity. In conclusion, the simple behavioral procedure here described provides a sensitive test to evaluate the time course of the effects of D2R agonists on rat basal activity. I thank Mari Paz Muñoz for technical help and C. Correa and A.I. Ortiz for veterinarian assistance. The present work was supported by Fondo de Investigaciones Sanitarias PI05/1324. There are no conflicts of interests. Ferguson, S.S.G. (2001) Evolving Concepts in G Protein-Coupled Receptor Endocytosis: The Role in Receptor Desensitization and Signaling. Pharmacological Reviews, 53, 1-24. Zhou, L.W., Qin, Z.H. and Weiss, B. (1991) Downregulation of Stereotyped Behavior and Production of Latent Locomotor Behaviors in Mice Treated Continuously with Quinpirole. Neuropsychopharmacology, 4, 47-55. Eilam, D. and Szechtman, H. (2005) Psychostimulant-Induced Behavior as an Animal Model of Obsessive-Compulsive Disorder: An Ethological Approach to the Form of Compulsive Rituals. CNS Spectrums, 10, 191-202.